Still healing from her last run-in with Hell, Nina struggles with not only her life as a Brown University student, but also as an intern at Titan Shipping, her father's company. Recurring nightmares about her father's violent death have become a nightly event, but being overwhelmed with guilt from Ryan's unexpected departure to the Armed Forces, and heart ache over Claire being across the ocean to protect him, Nina believes her sleepless nights are the least of her problems—but she's wrong. 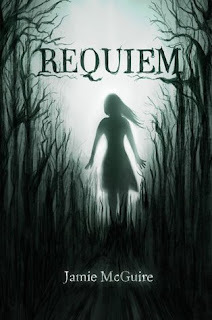 Requiem was a great sequel to Providence. Where Providence seemed to be all about the developing relationship between Nina and Jared, Requiem really gets into the action of the story. A lot of questions I had from the first book were answered, including why Nina and her family were assigned guardians in the first place. That was something that bothered me in the first place, what made her family important enough that they would need protection. It's answered well in this book and has a lot to do with the main storyline. I really liked that Nina started taking charge of her life a little more, both at Titan and training. Just sitting around waiting for Jared to save her just doesn't seem smart to me, so I'm really glad that she's done with all of that. Jared was awesome in this book. Seriously, not only is he ridiculously handsome, he's willing to take on both Heaven and Hell just to be with the woman he loves. What more could a girl ask for? I also loved getting to see more of Claire and Bex, and I really think she could write novels about either one of these characters. Really hope to see more of them in the future!